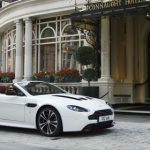 The first pre-release of the Aston Martin V12 Vantage was on Tuesday this week so for one to be spotted on a street in London a few days later was unexpected to say the least, especially considering the official release is yet to come out. This model is not the same car that features in the original press shots, this one is finished in gloss white while all the carbon fiber features have been finished in a deep red carbon. 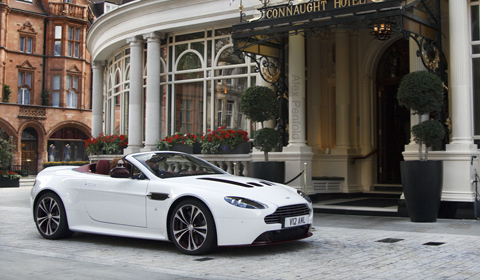 The V12 powered roadster comes with a few upgrades compared to its siblings, the V12 Vantage Coupe and the V8 Vantage Roadster. In order to enhance the aerodynamic properties ‒ making it comparable to the V12 coupe ‒ the rear deck lid has been revised and features a redesigned spoiler. The suspension has been modified as well to ensure the handling will be on par with the coupe. Furthermore the new roadster uses carbon fiber elements on the side strakes, mirror caps and near the taillights which on this particular car can be seen to be finished in red.